The last time I felt this way, the year was 2003. Newsflash: Gold is the bubble; the new tech; the new real estate if you will. Dinner parties, hair salons, and golf courses are awash with its glory. I don’t mean to be arrogant, but when you hear people with very low IQs adopt a new trend as their own, the froth is forming. Unfortunately, calling a top is an impossible task and stupidity can rule for very long periods of time. Real estate roared for another three years post-2003 before contrarian views were vindicated. Gold is a WMD in my view – a Weapon of Mass Destruction. It would make more sense if all the world’s nuclear warheads were made of the lustrous metal. Then it might be useful someday. There are almost no real world uses for gold aside from its value as currency prior to the advent of paper money. The same is true of nuclear weapons. Nuclear weapons were useful 70 years ago when their still-limited power was more manageable in very few hands. 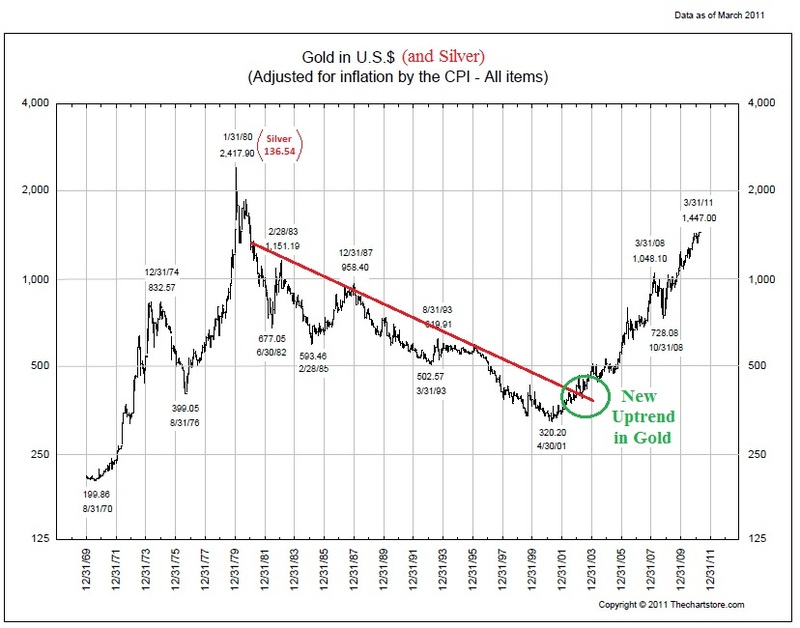 A primary justification for the high price of gold today relative to other points in history is government hoarding. It seems they worry that fiat currency may go the way of the buffalo. Government debt crises aren’t helping. But currency crises are nothing new – think back to 1998. It’s pretty simple: governments will curb spending on entitlements and huge military programs or be removed from power. They never plan to use their massive troves of nuclear warheads, and the same goes for their gold. Below I address the remaining reasons for the high price of gold: speculation, inflation/deflation, global economic collapse, and the collapse of the US Dollar (USD) as de facto currency of the world. Speculation is alive and well. The current trend has room to run, but sentiment shifts on a dime. I hesitate betting against the trend for another 12-18 months. Emerging markets are busy making sure inflation will remain muted for decades to come. Their cheap labor pool keeps consumer goods prices falling. Meanwhile, their heavy use of commodities like oil and useful metals keeps deflation at bay. As you can see, these forces are mostly a wash to the developed world. So what of global economic collapse and depression? Sure, it’s possible, but not likely. If it does happen, you won’t need to worry about your stocks and bonds. Since your gold is held in funds and electronic accounts, you won’t get a chance to touch it after our institutions collapse and your precious holdings are “reappropriated.” If you are the type to hold the physical asset itself, the roaming militias or forces aligned with the new world dictator should take care of you. Finally, the hot topic of USD weakness. It certainly took quite a fall on the world stage over the past decade. This can be explained by low relative interest rates and rising economic competition from across the globe. Keep in mind the falling USD has been a benefit to US investors in foreign securities and US corporations exporting goods abroad. The trend did hurt US consumers traveling abroad and drove the cost of imports from other developed nations higher. But the downward trend in USD has consolidated in the past three years. The USD index (DXY) against a basket of major currencies barely budged during the most recent August stock market turmoil. USD may yet push gold aside from the position of global reserve currency. Keep an eye on the DXY index the remainder of 2011. If it continues to move in the opposite direction of gold, 12-18 months may prove too long for gold prices to begin descending..